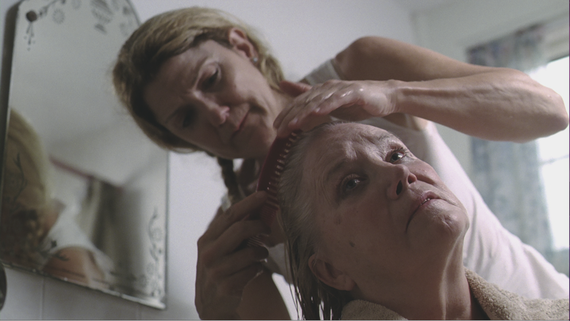 This week, making its New York City premiere, Writer/Director Sharon Greytak's gripping Archaeology of a Woman, plunges deeper into the portrait of dementia and its disturbing effects than any other recent film on the subject. 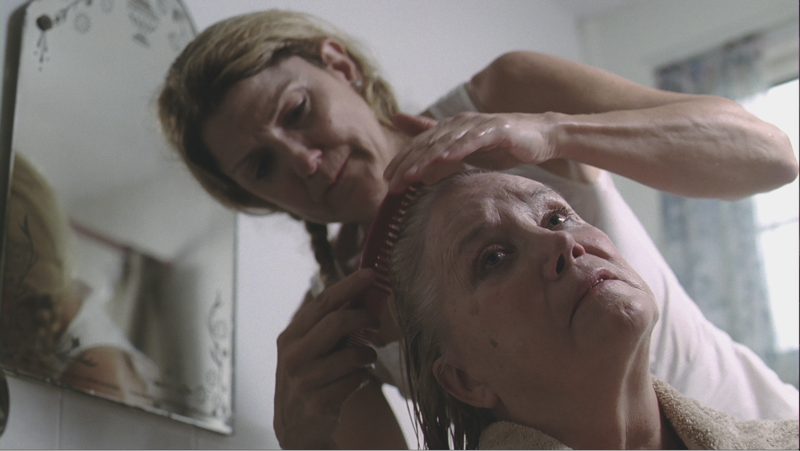 At the movie's harrowing heart is a tense, lacerating mother-daughter story featuring Tony Award winner, Victoria Clark, and Oscar nominated indie screen legend, Sally Kirkland baring her soul and her body, in a riveting, emotional tour de force. If the 2015 Academy Awards were really looking for a Best Actress based on the merits of courage, they couldn't go wrong looking Kirkland's way. In Archaeology of a Woman, Margaret (Kirkland), a feisty, tormented former newspaper columnist, fights to preserve her independence despite the dementia's gradual ebbing away of reality. After becoming lost in a supermarket parking lot and driven home by the police, her daughter Kate (Clark) is called upstate to aid her mother, and forced to halt her own career goals as a rising star chef in New York City. Add to this a Hitchcockian layer of murder mystery as a crime in Margaret's past comes to light while her mind fades to a murky black. 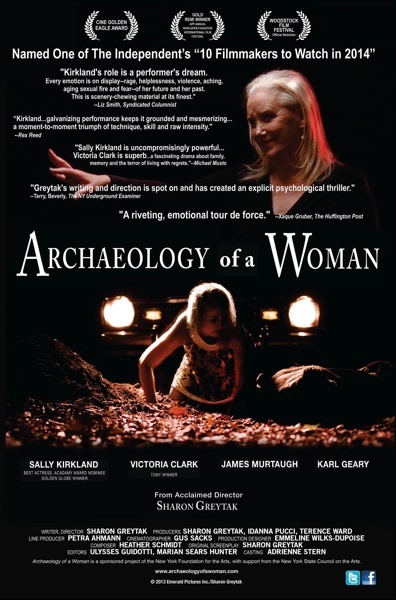 Sharon Greytak's ARCHAEOLOGY OF A WOMAN - Theatrical Trailer from Brian Geldin on Vimeo. Kirkland has always been a champion of independent film, and was in fact, one of the first recipients of the Best Actress Independent Spirit Award for 1987's Anna. Go back two decades prior to Anna, and she was making indie film history opposite Rip Torn in the fearless cult classic, Coming Apart. Indeed Kirkland is the only actress in history who started in Andy Warhol's Factory and went on to win a Best Actress Golden Globe Award - talk about a legacy. Archaeology being the latest chapter in a career spanning the past half century of independent film. The emotional range of this character goes from A to Z. One interesting quality is how sexual Margaret can be. I'm 72 now and I still feel very sexual and I'm sorry to say I don't see this in American movies - I do in European movies. Margaret's character goes to dark, complicated and very real places. Through the 1990s I was a caretaker for patients with AIDS, cancer, and Alzheimers - and that really prepared me for this role. This is Greytak's third and most ambitious feature to date, and was in part inspired by her own mother's issues with dementia. This woman (Margaret) has been a force her whole life, and nobody gives that up overnight. I experienced this with my own mother who retired at 79, and I relate to the character of Kate. You always see the story of the loving daughter coming home to take care of aging parents, but I know it more to be that it's the worst time to be running home, putting your own career on hold, and having to become the parent. I wanted to show the reluctant daughter - which is very real, and Victoria Clark pulls it off so wonderfully. Greytak has achieved notoriety as one of the only filmmakers today, male or female, directing, writing and producing from a motorized wheelchair. I've used a motorized wheelchair since I was fifteen, and I think my perspective on life and the flawed characters I enjoy writing and want to see onscreen come from my own striving for independence. The disability gives me a certain perspective. Archaeology Of A Woman Opens Friday, September 12 at the Village East Cinema (189 2nd Avenue, NYC 10003). Los Angeles dates to be announced.